Johannesburg (Agenzia Fides) - "The problem of unemployment in South Africa wears gendered faces and young faces. We therefore expect more women and more unemployed youth to be well represented in any platform designed to address unemployment crisis. We cannot talk about them without them", said His Exc. Mgr. Abel Gabuza, Bishop of Kimberly and President of the "Justice and Peace" Episcopal Commission of the Southern African Catholic Bishops' Conference, in an appeal to South African President Cyril Ramaphosa so that a broader representation in the next job summit which is scheduled for next year is considered. Mgr. Gabuza has welcomed that, through the President, the ruling party seem to be finally conceding that the National Development Plan’s goals are unrealistic. "We hope this will lead into effective consultations with all the stakeholders on the required adjustments to fit the current economic climate". Mgr. Gabuza also said he was happy "with the President’s leadership regarding the economic Stimulus and Recovery Plan, together with his commendable decision to establish an Infrastructure Fund". The South African population suffers the context of technical recession, rising prices of basic items, and rising unemployment. Other civil society formations have called for "the basic income grant and a serious review of youth wage subsidy. We hope that the president and his cabinet shall give critical consideration to these recommendations", concluded Msg. Gabuza. This year's work summit was held from October 4th to 5th. 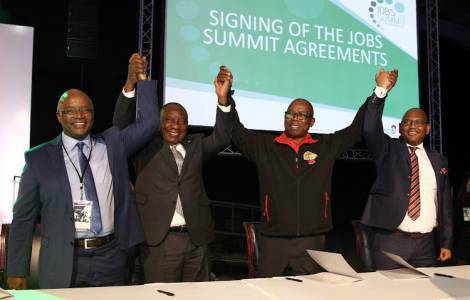 According to President Ramaphosa, the initiatives and employment agreements agreed by the participants will lead to the creation of 275,000 jobs a year. Data on employment in South Africa show that despite the employment growth of 206,000 jobs in the second quarter of 2018, the unemployment rate is 27.2%.